Increased numbers of NJ women have jumped into politics this election cycle. WAYNE, N.J. — Before women in this leafy Northern New Jersey district had any inkling of Democratic candidate Mikie Sherrill, a mother of four and former Navy helicopter pilot who's been a lightning rod for Democratic women in the area, they got to work creating their own grassroots groundswell. An increased number of New Jersey women have jumped into politics anew this election cycle — many fueling a movement aimed at flipping the historically Republican 11th Congressional District from red to blue. Women in the state have founded grassroots organizations, taken up canvassing routes and, after the primary elections this summer, seen high increases in voter turnout. 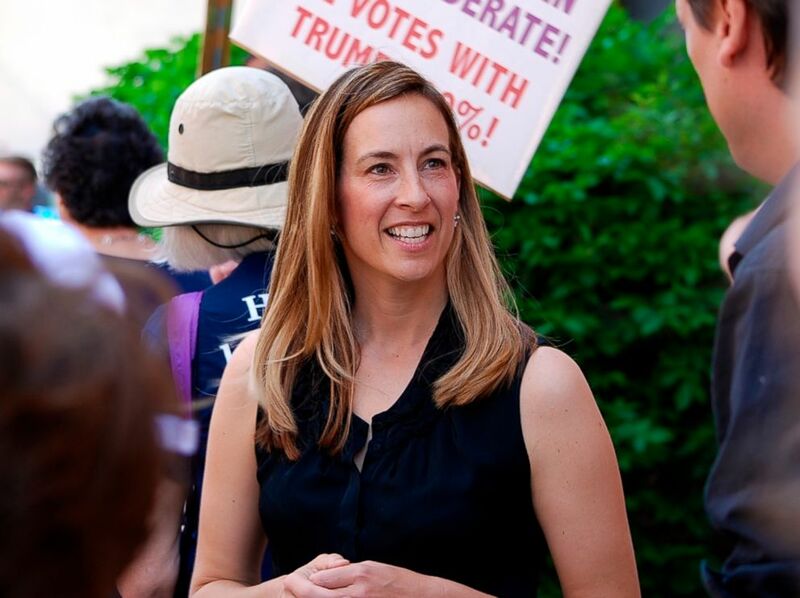 “I often tell some of the grassroots groups around the district that they really set the table for this election,” Sherrill said after a debate in Wayne, New Jersey on Thursday night. “I think this campaign was really built on the back of some of the work that they did early on,” she said. (Justin Zaremba/NJ Advance Media via AP, FILE) Mikie Sherrill joins protesters with NJ 11th for Change outside of Rep. Rodney Frelinghuysen's office in Morristown, N.J., May 19, 2017. Republican candidate Jay Webber, a state assemblyman in New Jersey and a Harvard law graduate, said he, too, feels like he has grassroots support from women — making calls, knocking on doors and signing on to a “Women for Webber” coalition. “I’m trying to talk to them about the issues that are on their minds,” Webber said, asked about securing votes from women in the district. “So, the first thing you have to do is listen, and the second thing you have to do is share with them your vision for the country and how it fits with what their priorities are,” he said. 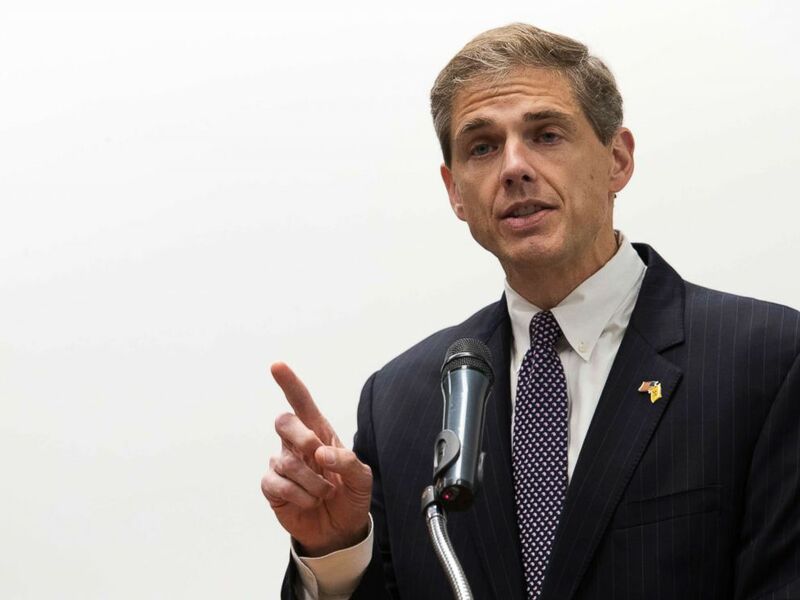 (Mary Altaffer/AP) Republican Assemblyman Jay Webber speaks during a candidate forum at the UJC of MetroWest New Jersey, Oct. 9, 2018, in Whippany, N.J.
Enthusiasm in this district is not strictly partisan — data from the Department of State shows over 20,000 new voters across all parties have registered since October of 2016. 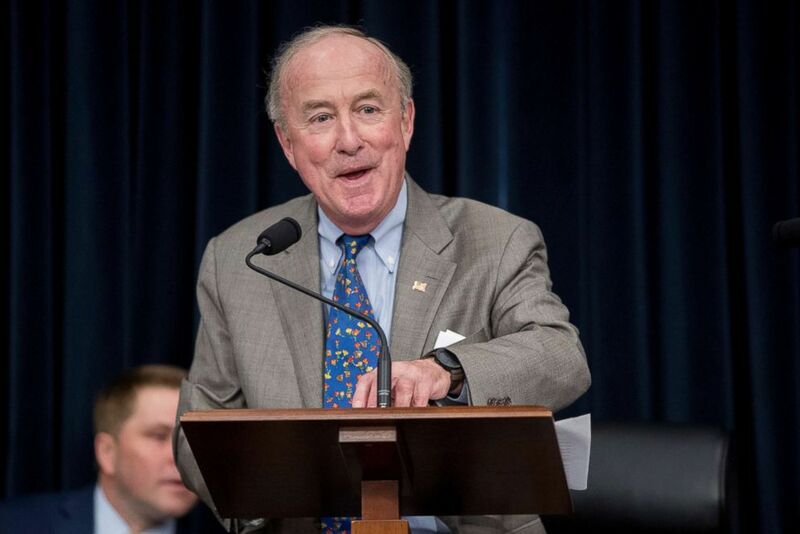 But the district, which was represented by Republican Rep. Rodney Frelinghuysen for over 20 years, voted for President Donald Trump by just less than one percentage point — and polls show his approval rating here remains split. When Frelinghuysen announced his retirement in February, Democrats saw an open seat race for the first time in 24 years and sought to seize on the opportunity. (Andrew Harnik/AP) Chairman, Rep. Rodney Frelinghuysen, R-N.J., speaks during a House Appropriations Committee markup hearing for spending on military and veterans affairs, on Capitol Hill, May 8, 2018, in Washington, D.C.
Data from the state reflects the efforts Democrats — and groups in the district primarily led by women — have made to push the district left. While Republicans in the district still outnumber Democrats by about 7,000 people, nearly twice as many new voters registered in the district since 2016 have been Democrats. “Our group and every group that’s been out there has been registering voters for two years now,” said Saily Avelenda, executive director of a group called NJ 11th for Change, one of the grassroots organizations that’s endorsed Sherrill and that sprung up after the presidential election. 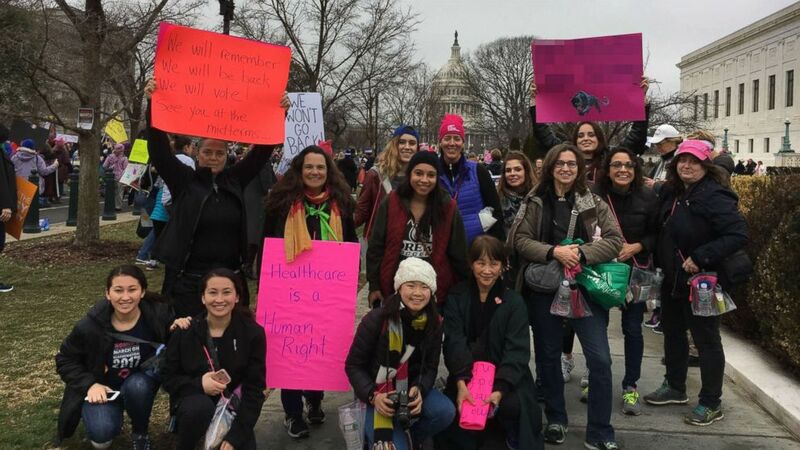 “For me, this was a whole awakening in terms of the power of people using their voices, and women specifically,” Avelenda said sitting in a coffee shop in Montclair, New Jersey, where the group had its first meeting days after the 2016 election. Avelenda pointed to a small corner where 15 people crowded around a small silver table the size of a dinner platter and came up with local goals they could focus on. Within a week, they had around 1,000 members in their Facebook group, which is their primary hub for organizing. Their Facebook membership now is just over 8,000, with around 1,100 on a volunteer list. “When we started, there were probably one or two people that had been political in the sense of being involved in some causes — but nothing like what we’ve done here. Nothing like what we’ve seen here in terms of women really coming to the forefront,” Avelenda said. “I think it has so much to do with the anger that women felt and how to channel that,” she added. Women make up about 72 percent of the group, according to Avelenda, and most came into it with the definition that civic engagement was “something you did when you voted,” she said. “After November 2016, I think we realized there was so much more that we could do — and we’ve got to do it now,” she said. About a year ago, Edelson started an organization called Essex County NJ Republican Women. She now serves as the president. Though the district has leaned Republican for many years, or perhaps because of that, many of the new grassroots organizations in the district support Sherrill, the Democrat. “People were frustrated because of Trump, women were frustrated because of everything, and then a great candidate who happened to be someone we could support and respect came to us,” said Pogorzelski, a mother of three and retired consultant from Mountain Lakes, New Jersey. “People said they’d never canvass,” said Pogorzelski, whose group is called 25/11, for the 25th Legislative District and 11th Congressional District. “Now, I’ll go out two to three times a week canvassing. Someone’s got to do it,” she said. 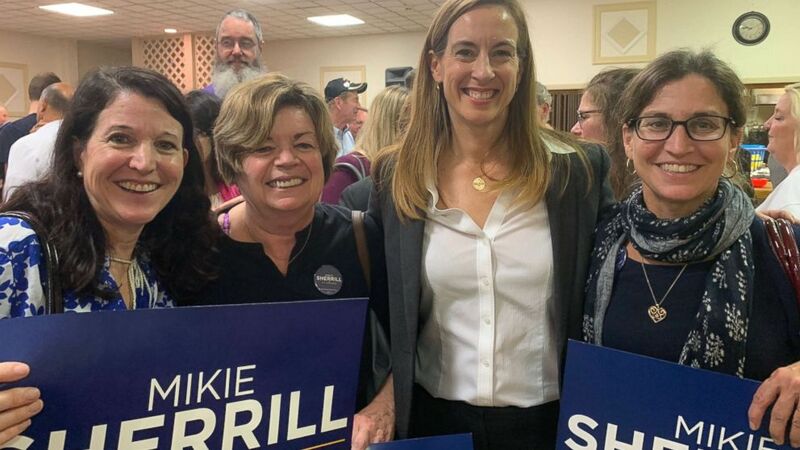 (Courtesy Dana Pogorzelski) Supporter Dana Pogorzelski, Democratic candidate Mikie Sherrill and supporter Chris Gemici attend a campaign event for Sherrill. A friend of hers and member of the group, Chris Gemici, was a registered Republican before voting for former President Barack Obama in 2008. In the past, she’s headed to the polls mostly during presidential election years. “If you told me a year and a half ago I’d be knocking on people’s doors,” she said, laughing. “It just shows you that I believe in Mikie and that she would represent us well,” Gemici said. For Marlena Cristiano, an employment recruiter and a mother of three, the push to activism stemmed from a number of issues. As a cancer survivor and a mother to a son with Schizoaffective disorder, affordable health care for people with pre-existing conditions is at the top of her list. Cristiano attended the Women’s March in January, the first large-scale protest she’d ever been to. “I do believe that incredible energy that came out of that day has really propelled everything that came after that,” she said. (Courtesy Dana Pogorzelski) Dana Pogorzelski, fourth from right, a leading member of a grassroots organization in New Jersey called 25/11, poses for a photo with a group of her neighbors at the Women's March in Washington D.C., Jan. 21, 2017. She admits she never expected to find a path to political activism now, in her 60s. “I do think that historically the youth are the ones who led the charge, who forced us to evolve and grow as a country — but this time it’s also the women who stepped up,” Cristiano said. “And I think it’s really exciting that its women who are doing this. And it is women. It is women who are doing this, there’s no doubt about that,” she said.